PriMed is a progressive medical group, planning for the future. We are focused on strategic growth where success is intentional for patients, physicians and associates. With each position at PriMed, it is imperative that the interviewing candidate as well as our current team members demonstrate a positive work ethic. We are pleased that our continued growth is due to quality team members that we employ. Dayton has so much to offer. From affordability to drivability, from an exciting arts scene to an extensive park system, the region offers something for everyone. Home to the University of Dayton and Wright State University, Dayton has earned the reputation as Ohio’s innovation center. Since the Wright brother’s first airplane factory, Dayton has been a hub for aerospace R&D. Healthcare is also a leading industry for the region. While employment opportunities in some business sectors have decreased, healthcare continues to grow here, with more than 30,000 workers employed by area hospitals. 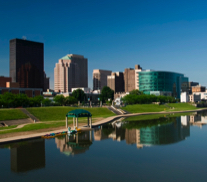 In 2011, Dayton was rated third of the top 50 US cities for excellence in healthcare by HealthGrades. PriMed is proud to be part of this thriving healthcare community.